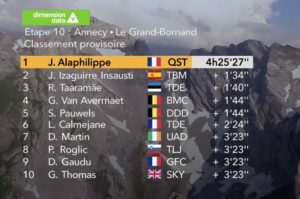 Julian Alaphillipe was the first French man to win a stage in this year’s Tour as he got ahead of the field and persevered to the finish. 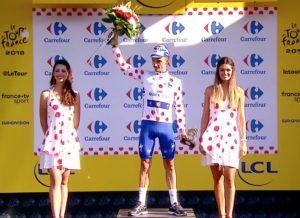 The 26-year-old QuickStep rider brought pride to the French nation by clinching the most difficult stage so far, the first Alpine stage. Alaphillipe also won the Polka Dot jersey having won enough sprint points to put in him in the lead. Greg Van Avermaet of BMC Racing retained the Yellow Jersey. Alaphilippe and Florian Vachon (Fortuneo-Samsic) went ahead, but got brought back after 10 km of racing. Then Sylvain Chavanel (Direct Energie) rode away with Thomas Degand (Wanty-Groupe Gobert) and Marcus Burghardt (Bora-Hansgrohe). A group of 21 riders was formed in several moves between the col de Bluffy (km 19) and the intermediate sprint won by Peter Sagan at km 29. Among them was Avermaet and Alaphilipe as well as his teammate Philipe Gilbert. 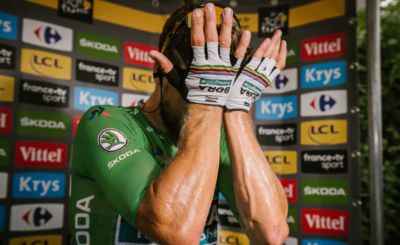 Joining them was Tony Gallopin (AG2R), Elie Gesbert and Amaël Moinard (Cofidis), Ion Izagirre (Bahrain-Merida), Jack Bauer and Daryl Impey (Mitchelton-Scott), Sagan and Lukas Pöstlberger (Bora-Hansgrohe), Serge Pauwels and Tom-Jelte Slagter (Dimension Data), David Gaudu, Rudy Molard and Arthur Vichot (Groupama-FDJ), Robert Gesink (LottoNL-Jumbo), Lilian Calmejane and Rein Taaramäe (Direct Energie), Guillaume Martin and Degand (Wanty-Groupe Gobert). The group split up the col de la Croix-Fry, the first cat. 1 King of the Mountain of the with Molard beating Taaramäe at the top. Gaudu led the charge but was overtaken by Alaphilippe before the first Haut Categorie KOM at Plateau des Glières. 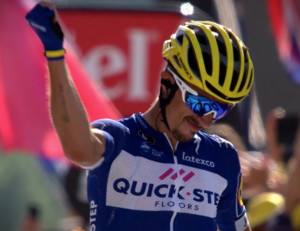 Alaphilippe who is this year’s winner of the Flèche Wallonne continued solo on the 1.8 km long dirt road where Chris Froome (Team Sky) had a flat before returning to the main peloton. The difference between the fifteen riders regrouped at the front and the bunch led by Team Sky was 6’40’’ with 90 km to go. The gap kept increasing in the long downhill to the valley. Eight minutes was the maximum difference as 18 riders regrouped at the front, Bauer, Sagan and Pöstlberger being successively reeled in. Taaramäe attacked 7 km before the summit of col de Romme while Warren Barguil (Fortuneo-Samsic) rode away from the peloton by himself. 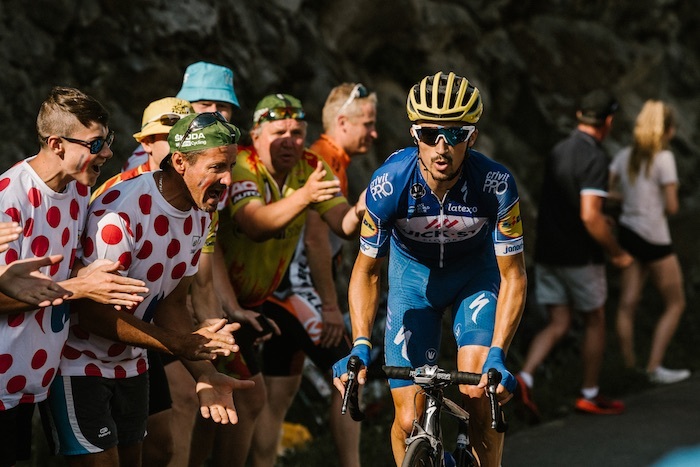 Then Alaphilippe rejoined Taaramäe with 4 km to go to the top of the hill. The Quick Step rider went solo to crest in first position, 15’’ ahead of the Estonian. 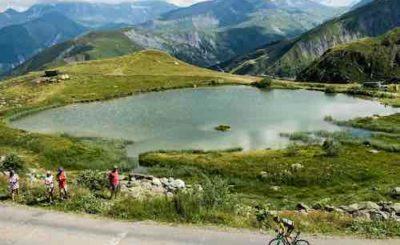 He increased his advantage in the downhill and in the following ascent to col de la Colombière. He passed the last climb with 1’30’’ lead over the first chaser Ion Izagirre. 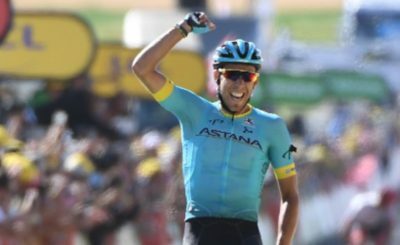 He didn’t make any mistakes in the descent to Le Grand-Bornand and had enough time to enjoy his first Tour de France victory. 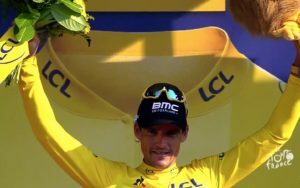 Fourth on the line, Van Avermaet who was designated the most combative rider of the day retained the yellow jersey in the first Alpine stage.